What’s the secret to good prose? What makes it work—not just on the aesthetic level of vivid and poetic word choices, but on the deeper and ultimately more important level of functionality? In short, is there a method authors can learn to create clear and powerful prose—or is it all luck and gut instinct? All prose—whether it’s the elaborate poetry of William Faulkner or the straightforward sentences of Cormac McCarthy—will always be instinctive on some level. Our word choices and sometimes the direction the sentences themselves end up taking can surprise even us sometimes. But if the structure that underlies our sentences and paragraphs is going to effectively convey our thoughts to our readers it will always adhere to the logical pattern of cause and effect. Dwight V. Swain, author of Techniques of the Selling Writer, famously cracked the code of efficient prose into what he called “motivation-reaction units,” or MRUs. 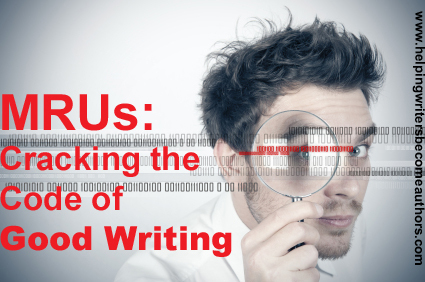 Just what are MRUs and how do they work to create good writing? For all that it sounds like part of an airplane engine, motivation-reaction units are an insanely simple concept. It boils down to the following model. In a story, everything that happens can be separated into two categories: causes (motivations) and effects (reactions). Once you grasp this, all you have to do to create solid and comprehensible prose is to make sure your MRUs are in the right order. 1. A car rear-ending your protagonist’s. 2. A cat curling up in his lap. 3. A girl accepting his proposal of marriage. 4. A lightning bolt hitting his house. 5. A line of dialogue. 6. A crack in the sidewalk that catches his toe. The possibilities, of course, are as varied as your story’s needs. The only limitation is that the motivating factor must be something that happens to your protagonist. 1. Slamming his car’s brakes. 4. Running out of his house. 5. Saying another line of dialogue in return. 6. Tripping and falling to the sidewalk. Easy-peasy, right? The only trick is . . . The catch to MRUs is that they must be presented in the correct order. When you tell readers about the effect before they’ve seen the cause, you’reintroducing an element of unreality, however minuscule. Even if their confusion lasts only a microsecond, you’re endangering their ability to process your story in a logical and linear fashion. In the example below, which order makes more sense? I whooped and did a dance right there in the front lawn after Kelsey agreed to marry me. Kelsey agreed to marry me, and I jumped up and down and whooped right there in the front lawn. 2. Action (can include involuntary physical response such as sweating or breathing hard). “Of course I’ll marry you,” Kelsey said. 1. Readers resonate with the natural progression of the reaction. 2. Readers can follow the development of the narrator’s thoughts,instead of learning about them after the fact, as would be the case if he spoke first, then shared his thoughts. 3. Readers know who’s doing the talking right away, thanks to the action beat (which isn’t such a big deal here, but would be in a longer scene with more characters). 4. Readers can lean into the strength of the prose’s linear pattern, instead of being jerked along by a less logical progression. Are there exceptions to the MRU? Absolutely. The whole point of the MRU is to create logical and clear prose. If forcing your paragraphs into the MRU ever runs counter to either of these goals, don’t be afraid to manipulate it to fit your needs. Same goes for the occasional bit of poetic license. Sometimes you’re just plain going to want to break the rules in order to achieve a specific effect.Keep in mind you won’t always need or want to include all three parts of the reaction. Sometimes dialogue will be sufficient to explain your character’s emotional and mental reaction. And sometimes he will confine his reaction to emotions and/or thoughts without offering any kind of speech or movement.At first, you may not find MRUs intuitive. Dialogue,in particular, often wants to sneak ahead of other aspects of the reaction,since we usually hear and transcribe the back and forth of our characters’conversation before visualizing their accompanying physical actions. To get you started, try editing an old story with a special eye on organizing your MRUs. Although you’ll certainly find places where you’ll want to make exceptions, I promise you’ll discover that your prose will emerge as a stronger and more cohesive whole. Tell me your opinion: Have you ever experimented with MRUs? I would think involuntary action should precede thought. Thought happens in a split second (or less); action, even when involuntary, takes longer, simply because it takes place in the physical realm. But that’s really splitting hairs. If you feel that a particular paragraph runs better with the action before the thought, there’s no reason not to write it that way. Thoughts need to be formed. Reflexes are. . . reflexive. If I should put my hand on a hot burner, I’ll pull it back first and ruminate on my foolishness later. I would argue that at least some thoughts (depends on how *formed* we’re talking about) are just as reflexive. But, as I said, we’re really splitting hairs here. The bottom line is that we need to try to organize our characters reactions in the order they happen. If you feel your character is acting reflexively before thinking (or if you just want to leave the thought out altogether to help speed the sentence), then that’s absolutely what you should do. In the sequel to a scene, sometimes I find my character mainly just deliberating, without any motivations or reactions. I understand this can get quite dull if my sequels are more than a page. 😛 Would the motivations be subtler in a sequel? Or is the whole thing a reaction? Or is there a different system altogether? Motivations and reactions only apply when the character is physically *doing* something. If he’s just sitting and thinking, then you’re not likely to have anything but straight narrative. But if he’s performing any kind of action while deliberating (which is often best), then the MRU will apply just the same in a sequel as in a scene. This is powerful! I’ve studied a bit about scene and sequel. Thank you for this added insight. I’m about a year late in reading this post, but this is amazing. Brilliantly written. I feel wiser just having read it. Great post! Glad you enjoyed! MRUs are such a simple way to transform your writing. Insightful article. I think there is a fourth thing that needs to go on in the reaction. The character has to read the other character empathetically (forming a cognitive theory of what is going on in the other character’s mind — even if wrong about it) before feeling, action and speech can happen. Your example has Kelsey speaking without the POV detecting if Kelsey is serious, snarky, excited or whatever. The POV character using his empathy ability to detect meaning and emotion in others is what allows the reaction to take place. Then it is like a tennis match, with empathy as the tennis racket and two characters lobbing motivation-reaction units between each other. To a large extent this comes down to the author correctly showing (versus telling) the other character’s portrayal (and thus the narrating character’s interpretation, which should be the same as the readers’ in most cases). But you’re right. Everything depends on the interpretation of the POV character. Fantastic article and explanation of the MRU’s. I’m just a bit confused about how this all fits into the scene and sequel elements. If I’m writing a scene with the goal, conflict and disaster, where do the MRU’s overlay onto this structure. For example, do each of the 3 elements have their own MRU. Similarly with the sequence. Would it be possible to provide an example of a scene and a sequel with the MRU’s in situ? Or point me to a section of one of your fiction books where this structure is easy to analyse. MRUs are tiny little beats within each scene–usually paragraph by paragraph. So you could have upwards of hundreds of MRUs within the overarching structure of a single scene. The examples used in the post (regarding the marriage proposal) are all complete MRUs. But I do not think (or I am pretty sure) that physical reactions not always come before thoughts and emotions. It is possible that physical reactions happen at the same time than emotions or thoughts of afterwards, but I would say that in 50% of all situations this is not the case. If someone who gets in an emotional moment then most of the time the physical reaction comes first (goose pimples, face gets red, shivering, eyes are gazing…), then the emotion flushes in and creates maybe another action (tears, cramps, aggressive behaviour) and the thougts are the last bit. Even when someone with panic attacks reacts not on thoughts but on an external stimulus that the body captures. Let’s say a woman sitting in a crowded bus, it’s summer, very hot, she was stressed the whole day. The body then realizes that it’s hot and narrow in the bus, it begins to sweat. This first body reaction leads to the first thought (“oh, this does not feels right”). This knowledge leads to the first emotion – she’s scared. The carousel of thoughts begins. This creates more emotions and other actions (physical reactions. And so on. So therefore I think the body reactions are very intermediate, not the feelings and thoughts. You can even prove this with the way our brain works. We have the reptile brain (the oldest part of our brain that works like an animal). This part is extremely fast, does not think intellectually. Then all the other brain parts function. When someone is in an emotional situation or in a stress situation, it is first the reptile brain that reacts. Then the amygdala (where our fight-and-flight-response is) which “produces” feelings like fear, anger, sadness. Our awareness/consciousness is normally the last that reacts because to think, judge, link knowledge and find solutions needs much more effort than create feelings or instinct (that is created by itself). So therefore I do not really understand the MRU. But maybe I misunderstood it? Thank’s for your help. You make a good argument. The thing that’s important to remember about the MRU is that most of the time, these three things happen almost simultaneously. In separating them into an order for the purpose of fiction, we’re creating a linearity out of something that is really more of a simultaneity. It’s true a physical response can happen before a conscious mental response, but never before a subconscious mental response. As writers, we have to translate certain subconscious responses into something that *sounds* conscious, in order for readers to interpret it. Don’t feel you have to force the MRU onto every instance in your writing, if it’s just not working. It’s just a guideline to help you set up proper and cause and effect where appropriate. Great article and very helpful. Thank you! I’ve been trying this out with the scene and sequel in mind, and the main thing I struggle with is fitting an MRU into the Decision. Does it even need one or is the Decision the tiny space between the end of the Dilemma and the new Goal? Scene and sequel happen scene-by-scene. MRUs happen paragraph-by-paragraph–even sentence-by-sentence sometimes. You’ll find MRUs in all parts of scene structure. Ugh, I’m having MRU issues again. What is the difference between feelings and involuntary physical actions? Thanks in advance…. Feelings are emotional; involuntary actions are physical.